When Nintendo launched the Famicom in Japan, the United States was undergoing a shift from videogame systems to home computers, often referred to as the "videogame crash". When Nintendo decided to break into the U.S. market, they renamed and radically redesigned the system to make it look less toy-like. The outcome is that there is a massive difference between the Famicom and NES in terms of design and additional hardware available. While there is some crossover early on, much of the later hardware was different between the two regions. The Famicom used the serial code HVC (Home Video Computer) for its hardware, while the NES simply used serial code NES. The original system released in Japan features a white, red and gold motif. The game cartridges are loaded into the top of the machine and stick out, displaying the game label. The two controllers are hardwired into the system and can be stored in the system. The Player 1 controller features the same button layout as the U.S. NES controller, but the Player 2 controller has a built-in microphone instead of a Start or Select button. Across the top of the system are buttons for Power, Reset and an eject switch to remove the cartridge. On the front is an expansion port that would be used for additional controllers and add-ons. The U.S. release of the Famicom was renamed and remodelled into a grey box with a flip-lid, making it more closely resemble a VHS player. The aim was to sell the system as a home entertainment device rather than a videogame console. You lift the lid on the front and insert the game, pushing it down into place. The NES game carts are significantly larger than the Famicom carts, and featured an indent for pushing the game down into place. While this helped Nintendo sell the console in the U.S., it also led to problems with dust build-up in the connectors located at the back of the system. The controllers are no longer hardwired, making them easy to swap or replace with other controllers and add-ons. The Famicom Disk System add-on was released in Japan in 1986 with the intention of allowing developers more freedom to create bigger games. The system ignored standard Famicom carts in favour of large yellow disks that often contained game data on both sides. The Disk Cards allowed for data to be written to them, such as save data or for whole games to be copied onto a blank Disk. The system could also manage larger quantities of graphic data and featured an extra sound channel. The Disk System was a success, largely due to the software library. However, games would often require you to swap the Disk side during play in order to save progress or to load a new part of the game. The system was also notorious for suffering from hardware faults. Eventually, the system was dropped in favour of game carts again. The U.S. market received many of the Disk System's games on cartridge with only minor alterations to the game (such as the loss of the extra sound channel, and passwords in place of save data). New Famicom / NES "Top-Loader"
Late in the life of the Famicom and NES, Nintendo relaunched the system with a smaller redesign. The redesign was mostly identical for the Japanese and U.S. releases. The system has been nicknamed the "top-loader" by Nintendo gamers. The system also came with a redesigned controller. When the U.S. redesigned the Famicom into the NES, they also redesigned the controller. The button layout is much the same as the Famicom controller, but features a black, grey and red design and sharper edges. Because the controllers could be removed from the system (unlike the Famicom), there is no distinction between the 1-Player and 2-Player controllers, meaning the Famicom's microphone input on the 2-Player controller was also removed. A light gun controller for the Famicom and NES. The original Japanese version was modelled after a realistic gun and came packaged with a holster and Wild Gunman. In the United States, the light gun was redesigned to a sleeker and more futuristic design in two shades of grey. it was later changed to orange and grey to make it look as little like a real gun as possible. When the trigger is pressed, the TV screen flashes black and white blocks, and the gun reads if it's pointed at the right area to register a hit or a miss. The basic technology was an extension of Nintendo's earlier Kousenjuu light gun toys and Laser Clay Shooting System. The Famicom Robot and Robotic Operating Buddy were released in Japan and the U.S. in 1985, and were compatible with just two games: Stack-Up and Gyromite. The Robot received instructions from the TV screen through its eye sensors to move its arms left, right, up, down, open or closed. Both Stack-Up and Gyromite come packaged with either the Block set or Gyro set, each changing the way R.O.B. interacts with the game. The arcade-style NES Advantage controller featured a large digital joystick input and larger A and B buttons. The controller featured a number of other options, such as a switch for swapping between Player 1 and Player 2, Turbo switches for the A and B button, and a "Slow" feature that was essentially no more than a Turbo switch for the Start button. The NES Max controller was a more rounded control pad released in the U.S., featuring a standard button layout plus Turbo buttons for the A and B buttons. Originally released as Family Trainer in Japan by Bandai, and Family Fun & Fitness in Europe, Bandai briefly released the Family Fun & Fitness in the U.S. before recalling it due to a licensing deal with Nintendo of America. 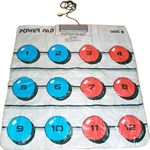 Rebranded the Power Pad, the American release became a first-party Nintendo accessory. Nintendo of America also licensed a number of the Family Trainer games from Bandai in Japan. The Pad features 12 buttons on each side that you use to control the action on screen. The compatible games were largely fitness titles, such as Dance Aerobics and World Class Track Meet. A wireless, four-player adapter for the NES. The battery-powered main unit used an infra-red signal to the receiver connected to the NES to allow four players to play simultaneously. Despite this, only 22 NES games supported more than 2 players, mostly sports titles. Nintendo of America acquired the licenses for Nintendo World Cup and Super Spike V'Ball from Technos Japan. 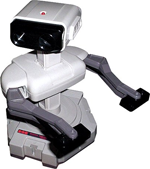 Only one compatible Nintendo-developed title was released: NES Play Action Football. Like the NES Satellite, the Four Score allowed up to four players to play simultaneously. The list of 22 compatible games is the same as for the NES Satellite. The only difference is that the Four Score was connected to the NES controller ports, meaning it did not support wireless play. The redesigned controller for the New Famicom and NES Top-Loader took its design inspiration from the Super Famicom / SNES controller, released around the same time. The Family BASIC set included a Keyboard, with an optional Data Recorder sold separately. The whole setup transformed the Famicom into an early 1980's home computer. The Data Recorder was also compatible for saving edited stage data in a number of other games, including Excitebike, Mach Rider and Wrecking Crew. A redesigned keyboard and Data Recorder were also planned for release in the U.S., but neither materialised. Despite this, the above games still featured the option to record data, leading to errors if you attempt to save your edited stage data. An advanced 3D system released for the Famicom that received video signals through two 3.5mm jacks and displayed 3-dimensional images using the liquid crystal shutter display glasses on compatible games. Only 7 games were compatible with the system, which included Nintendo's Famicom Disk System racing game 3D Hot Rally. In the U.S., compatible games were released using a standard pair of 3D glasses, which included 3D World Runner and Rad Racer, both developed by Square. Released in 1988 in Japan, the Famicom Network System was Nintendo's first foray into online activity. The system acts as a modem, and connected the Famicom to a server through a network cable. The server provided the ability to view news and weather reports, trade stocks and find out game cheats. Content could be downloaded to the Network system as well. The Network system came with its own controller that featured a numeric pad for interacting with the server.